Last week I attended the ANLAClinic in Louisville, Kentucky, from Wednesday through Saturday. The ANLAClinic is a yearly educational event for members of the American Nursery and Landscape Association. During the clinic attendees listened to speakers, participate in workshops and seminars designed to help them navigate all aspects of the business. It was my first time attending. I was a freshman, if you will and the ANLAClinic was a lot like high school, or attending a high school reunion. Merchandising example at ANLAClinic created out of wood pallets and featured Flat Tire Decor pots, which I'm happy to boast were a garden bloggers discovery last year. I was presenting on garden bloggers and had my two presentations memorized down to the exact second I had been allotted. I decided to do away with the Power Point presentations because I’ve always been bored by lectures in school. Like a freshman on his first day of school I walked into the wrong room for the first presentation. While running to the room I was suppose to be in I was stopped by an attendee who recognized me from the schedule and said, “Good luck today. Don’t be nervous because you’ll be presenting before all the important people in the business.” Well, gee, I wasn’t up until that moment. Then I got up for my part and it dawned on me that I was presenting in front of some of the most important people in the industry. You can imagine what happened next. I bombed, not just one of the presentations, but both. Ouch. Adding to the feeling of being in high school were the long hallways and people going from room to room at regular intervals. Everywhere you looked there were people greeting each other and introducing themselves to people who they hadn’t met yet. It was impossible to navigate the clinic without being greeted by a smile, shaking someone’s hand or being talked up. The breakfast and lunch breaks were always interesting because you could be joined by someone you hadn’t spoken with, or you could meet someone you’d already shared a meal with. I’d never encountered such a friendlier bunch of people in my life. It made me a little suspicious, to be honest. In the evening there were sponsored hospitality suites and I soon learned what I had to be suspicious of. There was always someone sticking food and drink imploring you to have a good time. Not the best place to be if you’re already upset about the pounds you added during the holidays. The elevators rides and walking the hallways after people indulged in food and drink were hilarious. The last evening of the clinic hosted “Garden Idol” where several plant breeders competed just like in American Idol to win what can best be described as plant of the year for 2012 using music, costumes and skits. Hort Couture Plants won “Garden Idol” and I’m really excited to grow their Under the Sea line of coleus this year. They are truly stars. 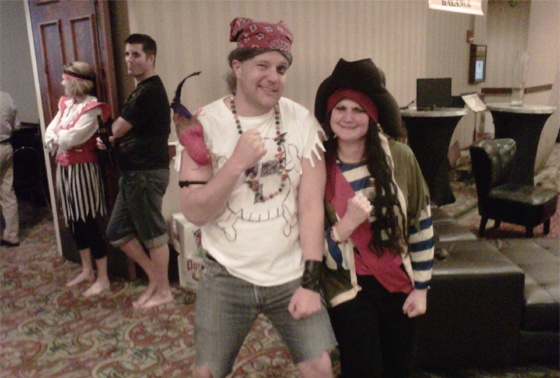 But I couldn’t help feel a little sorry for the people from Monrovia that did a fantastic pirate themed skit. After “Garden Idol” ended the biggest party of the clinic took place where attendees opened up their wallets for money for charity. As the Baby Boomer generation continues to age, the industry is obsessed with reaching young gardeners. Everywhere you go nowadays the industry is talking about ways to reach out to young gardeners. There were a lot of talks and presentations about how to achieve this, but I found the best example from an ANLA member and attendee. Check out the Plants vs. Zombies: Real World Solutions video from Lancaster Farms in Virginia. More like this, garden industry. If you're looking to reach young gardeners you need to think like a young gardener and make gardening fun. On the day the “ugly gardens” debate resurfaced on Twitter I made the choice to ignore it for the most part. I’m really tired of people and brands who, as garden communicators, have no qualms about crapping all over a gardener’s attempt to garden. I wasn't going to get into the debate and let it bring me down from my high. But I couldn't escape it.That same evening while walking into a hotel bar a man stopped me and said, “You’re the blogger! My wife has been talking about you all night.” The wife in question turns the corner and says, “It’s true. I’ve been telling him that we should support the bloggers because garden writers have gotten too full of themselves.” It was an apropos end to that particular day. The morning of the last day I had a presentation on blogging. I was surprised how many people showed up given how early it was and how hard people partied the night before at “Garden Idol” and Party With a Purpose. Those three days went by really fast and the final day I was full of ideas and inspiration after speaking to people who were genuinely friendly, eager to learn how they can be better garden communicators, sellers, and buyers of the garden lifestyle. I have to admit I got a little bit verklempt because I realized that just like in high school I’d made some friends at the ANLAClinic who I’ll know for life, and there were others I’ll wish I had gotten to know better. I have no complaints about the event of my participation. Everything about it was a positive experience for me. From the suite I was put up in for free to the housekeepers and the catering staff at the Galt House Hotel, everyone I came into contact with was awesome. A big thanks to everyone involved and especially to Kellee and Stephanie for all the hand-holding they had to do with me. I appreciate the opportunity you all gave me to travel out of state and talk about what I do. I want to thank the following people and brands for spending time asking about garden blogging and showing an interest in this thing we do. I misplaced a lot of business cards so if you're someone I came into contact with please leave your link below. Chicago Tree MD. Randolph's Greenhouses.Sun Gro Horticulture. David Austin Roses.Garden Media Group.Perennial Gardens.Peace Tree Farm.Wallitsch Nursery and Garden Center.Organic Mechanics.Pines Lawn and Garden Inc.Midwest Trading.Great Garden Plants.Enchanted Landscapes.Fairfield Garden Center.Meister Media.Lancaster Farms.B Wise Gardening. Same here, Jim. Always nice to see you and your awesome plants at events. 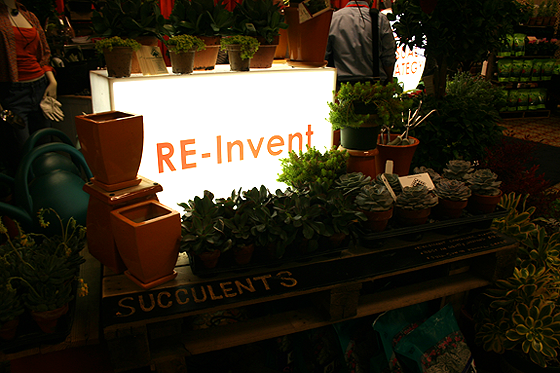 Looking forward to seeing your plants at the Chicago Flower & Garden Show. Sounds like a great time! Those coleus really are unique, I'd like to try some myself. Will they be in certain stores? When you find out, please let me know! Hi, They're being rolled out nationally this year. Although, you'll only find them at independent garden centers across the country. Ramon: I agree with you...I told a few people the Clinic felt like high school graduation this year...we had a great time and then all went our separate ways. Hope to see you again some day. Also, what a pleasant surprise to see that you really like our video! Thanks! Everyone with experience has bombed at least once. Good for you for not hiding in your room after the first night. Looks like the results were worth the effort.